For a more serene take on the traditional safari, Hanna Jones laces up her hiking boots for close encounters of the wild kind in Kenya. Promises have been made: hike to the top of a huge rock called Nyasura in the distance and be rewarded with spectacular views over the plains. After about 15 minutes or so, it isn’t the vista that proves to be the most magical element of the climb: we can hear men singing. Since we’re in the middle of nowhere, Kenya, this comes as a bit of a surprise, but it does provide the impetus to get moving a little faster towards the summit. Suddenly, we happen upon three Samburu warriors by a small rock pool. Each of them is washing his clothes in the water. It’s hard to say who is more startled to see the other, but pleasantries are exchanged and we eventually continue on our way to the vantage point overlooking the Ewaso River and Laikipia landscapes. 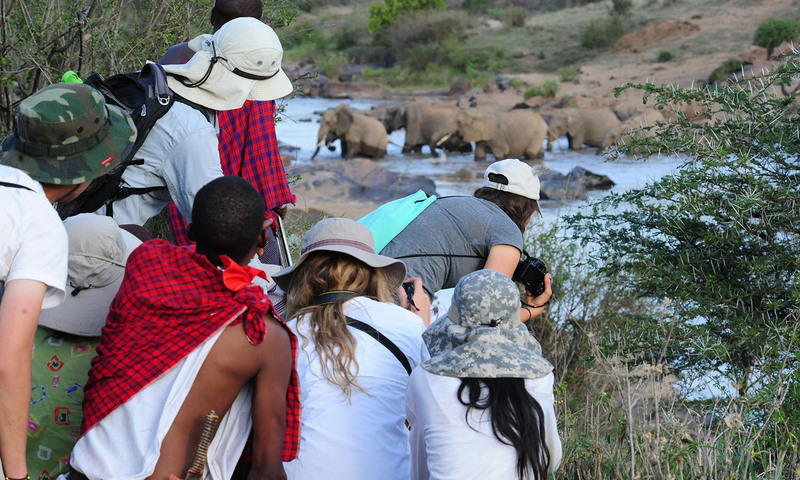 There’s no denying the appeal of taking an Ewaso River Walking Safari. This gentler, quieter approach to exploring the African wilderness offers the seasoned visitor to the continent another avenue to exploration. Words can’t describe the feeling of walking through empty Laikipia landscapes. On a well-worn elephant trail we bump into an old man who has nothing but a spear in his hand. He speaks briefly to the guides and trackers and is on his way once more. At other times I’m acutely aware of the levels of life in this landscape. Without a vehicle to separate me from the environment, I can appreciate even the smallest of insects and flowers. But, this being November and the beginning of rainy season, there is plenty of other animal action. The acacia bush country is home to giraffe, zebra and impala, as well as monkeys and birds. Elephants, who like to bathe in the muddy stretches of the Ewaso Ng’iro River, can also be spotted. One of this walk’s unique aspects is its guides. 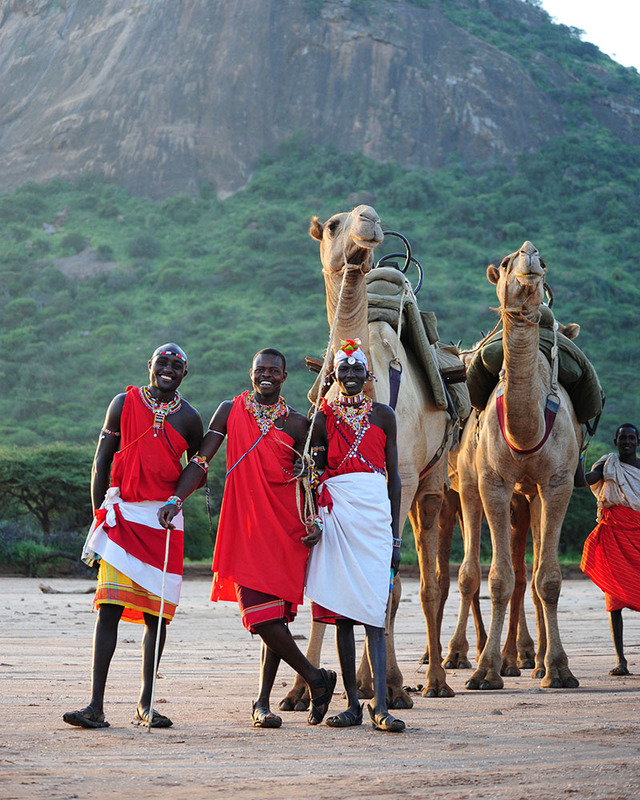 Hailing from the Samburu tribe, who live mainly in north central Kenya (they’re related to, but distinct from, the Maasai people), they lead the safaris dressed in traditional attire. This includes shoes made from old tyres – and if you doubt the effectiveness of such footwear, I’m here to tell you those old Bridgestones seemed to offer better footing than my hiking boots. They lead camels – a strange sight on the African plains – which carry food, water, cameras, camping gear and, whenever needed, weary walkers. The guides are kind and knowledgeable. Walking alongside them or sitting around the campfire in the evening allows for easy conversation. I learn about their culture and customs, traditions and lifestyle, and in just a few short days they go from being the people who show me animals to fast friends. Each day is a little bit different on the safari. I’ve opted for the luxury option and the tent has a bed with a proper mattress and linen, robes, lanterns and chairs out the front. Every morning begins with an early wakeup, as one of the guides pours warm water into a bowl so that I can wash my face while looking out over the landscape lit with the soft sunshine. Considering the camp is packed up and moved each day, the standards are remarkably high. Each afternoon we explore the area around the camp, only to find one of the staff members hiding behind a tree with snacks and sundowners ready to go. Even the tonic water for the G&Ts is icy cold. Dinner is cooked over a fire on the ground, then, after the talking is done, there’s nothing to do but head for bed where the sounds of the bush surround my canvas home and act as a wild lullaby. Fly to Kenya with Kenya Airways. Bench Africa offers a range of safaris, including a four-day Kenya Walking Safari.